You can always learn something new from BEE. Like holding a hat as an accessory (for picture purposes) in addition to wearing it on your head, of course:). love love that top! gorgeous on u! Love the outfit, simple and chic! You look so pretty in this outfit, love the flared jeans. The hat and bag are both really cute! This totally feels a bit 70s...I love it! I've been hunting down a pretty sunhat, but I can't seem to find one I like! You look adorable, love the jeans. Such a pretty peasant top, love the 70's vibe you have going on. I am loving that top its really pretty , love the hat holding too hehe. 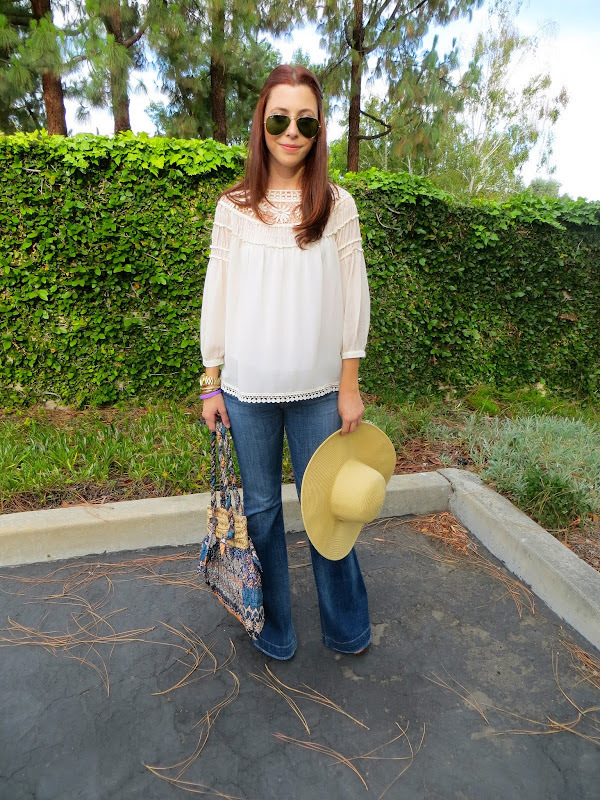 I love the boho look of this top! Looking gorg missy! I love your hair color! Super cute top! Love the lace detailing on the blouse. So pretty and hippy chic! P.S. I totally pinned that hat picture from Atlantic Pacific, and will be giving it a try soon. Such a great shot. Loving this bohemian look Rita! The peasant top is adorable and you look so stinkin' good in flared denim. I'm way too tall and feel like I take up too much space in bell-bottoms! No girl! Don't even think that! You would look stunning in flare jeans ESPECIALLY because your TALLER:)! Love your peasant top. Gorgeous and those jeans are fabulous. Did you get my email re. guest posting this Summer? Hope you can. Thanks again for thinking of me Agi! I'm looking forward to it:))! Love this pretty boho look on you! Those jeans look amazing on you...wish I was tall enough to pull those off! PS I watched the OC ladies last night on the DVR and I pretty much died when I saw those Mexican strippers! THank you so much Sharon! I did too! It was hilarious:)! Vicky is too funny this season! This is so pretty! I love your pictures and your outfit :) the top... Oh my.. I really want it! The jeans look great on you but they could never look good on me I think. Great post, lovely! Girl, they would look gorgeous on you:)! Lady, I love this boho look on you! Your top is so delicate and pretty and I love a big hat! Love this! Kinda retro and I dig it. Cute top! Great retro look. I finally found a hat for the summer! I actually feel kind of silly wearing it because I've never been one to wear hats, but it's nice for sun protection. Have a great day! I love this bohemian look, dressing this sort of a way has become more of my style. Free-spirited yet fashionable! You look great! Thanks so much for all your comments while I was absent :) MUCH LOVE! i love this boho look on you!! such a cute look - effortlessly chic! Love this look, remind me the '60! You look great in a 60s vibe! Great look! So boho and chic at the same time! True CA bohemian girl - love it! What great boho look Rita! That top is so pretty on you! Love it. Thank you all so much for the kind words:)! Love your white top - looks so feminine and trendy at the same time! Hello, dear! I am totally in love with your blog and your unique style! Would you like to follow each other? =) My blog is about one fashionista living in the capital of Russia. I will be happy to see you in my blog!!! Hi Lise! Thank you so much! I would love to! Love the Blouse & the Hat. Bohemian. Chic. Cool. Fresh. Summery. Casual. Fun. Thank you so much Ada! Vivian is an absolute cutie pie! As for the meet and greet, I will definitely send you an email so we can discuss it further:))! That's a pretty nifty idea. Thanks for sharing, am going to have to introduce hat holding in my next style posts! What a gorgeous outfit, I love the shirt so much and you are such a beauty, too! Love this look! Great sunnies! You look so cool in these bell bottom jeans and top! I just love your outfit. BTW: What kind of shoes were you wearing with these amazing jeans? Hey darlin! Thank you so much! I was wearing my steve madden wedges (the pair in my collaboration post above:)! Love everything about it! Love your top and your jeans!